Please send us shots of your favorite places to read and how to credit the photo. Would you like to receive the Weekly Challenge via email every Wednesday? Just click here, and send us an email, no need for text! I love to read in the Garden Window --sitting on the ledge, its a little bench that only I fit on! 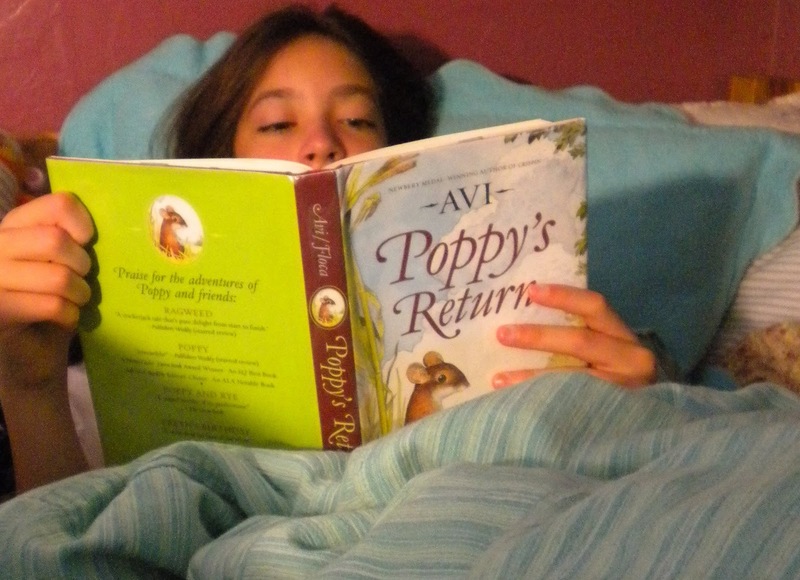 I like reading in my bed, right before I fall asleep --because nothing distracts me and I feel warm and cozy! I second the Big Sister --I LOVE to read in bed. I have a Carolina Rocker in my study, bought in the 60's because JFK had one. I'ts padded with a horse blanket from a friend in Santa Fe. I am reminded of both when I sit in it to read. We are camping, it's perfect weather -sunny but not too hot. All the camper flaps are unzipped, a perfect breeze and I have all afternoon to doze and read in the big old camper bed. And the Mom and the Sisters are asleep! I will send some shots of a couple of my favorite places to read soon! 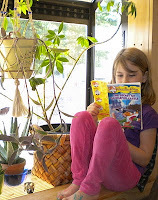 The thing I love about 'favorite spots for reading' is that although I have places I prefer and enjoy reading (I third the Big Sister in that I love to fall asleep reading a book, or to always read a little bit (or sometimes A LOT!) before bed), that sometimes, I am overwhelmed with an absolutely perfect reading spot--it may be a swinging porch swing, when the breeze is blowing a certain direction, or under a large, rugged tree, in a crook, where my back fits perfectly and I am not uncomfy. Reflecting on spots I dig to read in I am reminded of a scrumptiously cozy spot found while wandering through Washington, D.C. I was a part of the Washington Center's Women As Leaders program http://www.twc.edu/, and one afternoon while walking alone, thinking on my next journal entry, I found the most perfect spot underneath a blooming cherry tree, not far from The White House. I remember feeling overwhelmed by the history I was surrounded by, the responsibility I felt for my efforts of activism, the city's buzz, and yet the still, sweet, almost 'silent' spot, in nature, just steps away from the commotion of it all. I sat right down, wrote a brief journal entry attempting to capture the stirring I felt inside, and then opened a book, spending the afternoon gallivanting the insides of a collection of stories by Alice Walker. Thank you Sisters, for the 'simple' challenge today! While reading the comments from The Poet, referring to JFK, and then The Dreamer, reading near the White House, --The Little Sister said, "it feels like poetry!" And we agree --the perfect place to read is like poetry! I agree that reading in bed is lovely, and I have a favorite reading spot on our back porch, but last night I found a new favorite reading spot. My 7 year old and I were lying at opposite ends of the couch each reading our own books. The house was quiet because little brother and littler brother were both sound asleep. Both of us reading silently. Each wrapped up in a unique journey, with just the soles of our feet gently touching and acting as a reference point to the here and now. Every once in a while she would peek at me over her book and smile. Her so proud of her accomplishment and me so proud of her. The only thing better than reading to her has been watching her become a reader. In my hammock under out big maple tree! The husband let me pick out an overstuffed chair complete with ottoman for my birthday this year. Then he set it up in the bedroom complete with view of the backyard, a great reading lamp and a remote for the tv (on the off-chance that there is something to watch!) It's my favorite spot for knitting, reading and sometimes even napping! The reality for our family is that most of us read in bed...for the children it's because the bed is quiet and warm, for me, the Mom it's because all is well when I stay in bed with the children. I have abandoned all efforts to read upright, as they usually get interrupted by the pitter patter of children's feet sleepily seeking out the absent warm body. Dad can escape more easily, and gets to sit on our "couch" (a pair of vanagon seats) early in the mornings. But he prefers reading in our nonexistant hammock outdoors. 1) In my bedroom there are 2 high-backed red velvet armchairs with a lamp in between. There's also an air conditioner in the window which makes this a haven in a hot, humid summer, and a relaxing place to read before I go to bed. 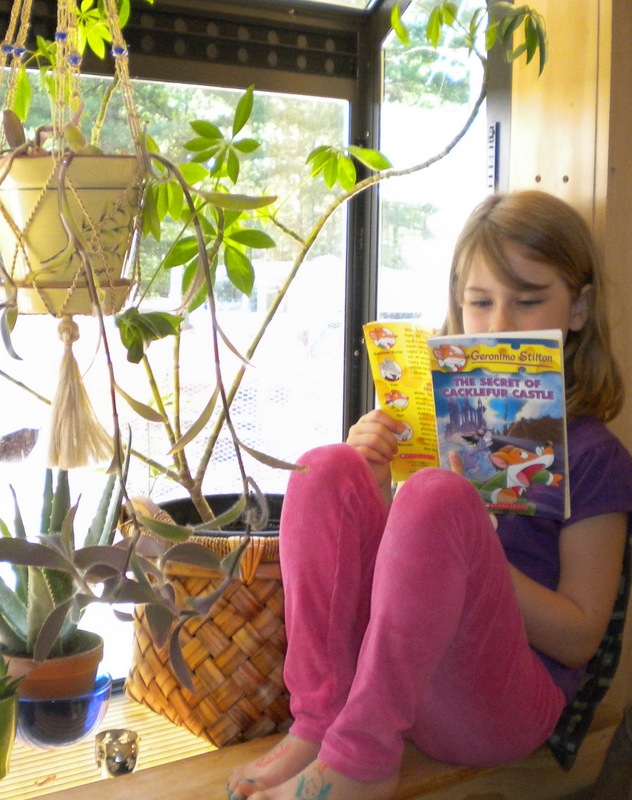 2) In the library/den there's a high-backed rocking chair also good for reading. I am liking all this snow (we have a lot in Northern Michigan already! )loving winter especially thanks to BFWP my list of books to read is ever growing! "I like to read at ANY beach, because it is so fun and you are relaxed! You think funny thoughts, you feel the wind blowing on your face, but wait, you have a book, you can't feel the wind, just the pages blowing in the wind! You put your hand down to hold the place you are reading, you look around on the page and find the word you are on. Around me I see sand and water and my Sister reading as well --now I must stop and read my book in bed!!" There is nothing like a hot bath and a good book. But I have to agree with the Big Sister... Reading snuggled up is the best!